This is a beautiful room to add to your property. A wet room is something most people would love, but very few people have the space to even consider. It is truly a great feeling to just walk into a room and shower where you stand. If you have a wet room it will certainly be a strong selling point if you wish to sell your property in the future. This is definitely the core of our business! 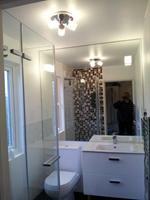 Many of our clients refer us to friends and family because they are so happy with their new bathroom. It seems to be our most popular selection. We can design, supply and build, or simply change the taps, but we do it well and this is how the company has grown so much. This is a big deal for every property as it is a strong selling point. Potential buyers go straight to the bathroom and kitchen: they say this is where decisions are made. Ward Refurbishments have been fitting kitchens for more than 15 years. This is the company’s roots. Whether it is lighting, under-floor heating, adaptions or a full house rewire, we can do it. We supply and fit and we will test your installation to ensure quality and safety. Call us for all emergency call outs, central heating adaptions, power flushing, boiler services and repairs, full central heating installations, bathroom suite installations and shower installations. We do first fix work, second fix work, real wood flooring, laminate flooring, staircases, balustrades, internal and external doors, loft hatches, windows, bespoke furniture and much more. We can tile any part of your home, including bathrooms, shower rooms, kitchens and foyers. We believe this is a very important part of any job as this is what clients and potential buyers see the first. The tilers we use are first class and this is one of the reasons we are recommended so much. This is such an important part of your home to get right! This finishing trade is what we all see so anything less than perfect is not acceptable. Whether it is wallpapering or painting you are guaranteed a beautiful finish with our painters. Plastering, dot and dabbing, mechanically fixing track, board and float, and setting. All of these trades are a day to day business for us now, but we used to sub contract these wet trades out. They are not exciting or at all interesting but they are very important. They are an area we have grown in over the last 5 years and now we cover all these trades in house.